exceptional services in promoting special & privileged strategic partnership between Russia and India. UAE announced its highest decoration for PM Modi on 4th Aril 2019, in recognition of his 'pivotal role' in strengthening ties between the two nations. Conferred on PM Modi for his contributions to the growth of the Indian and global econoies crediting 'Modinomics' for reducing social and economic disparity between the rich and the poor. 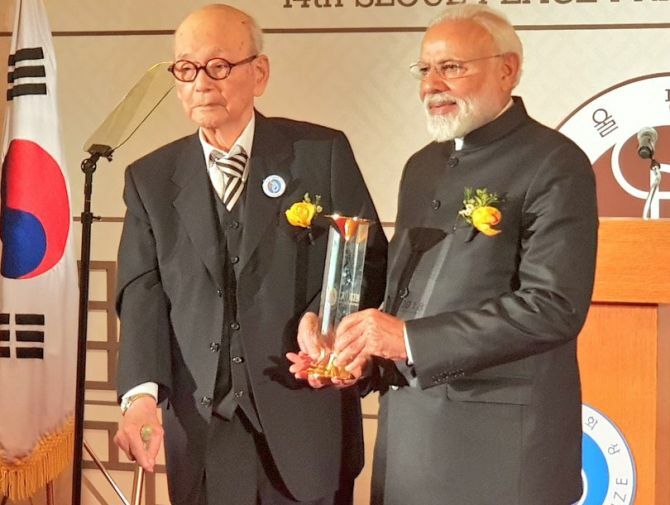 On 10th February 2018, Modi was conferred with the award by Palestinian President Mahamoud Abbas, recognising his contributions in promoting relations between Indian and Palestine. The highest environmental honour of the UN. Modi received the award on 3rd October 2018 from UN Secretary general Antonio Guterres. He was selected in the leadership category for his pioneering work in championing the International Solar Alliance and also as acknowledgement for his unprecedented pledge to eliminate single-use-plastic in India by 2022. 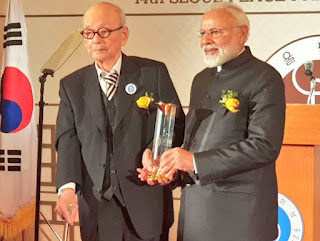 PM Modi, during his visit to Afghanistan, was on 4th June 2016, conferred with the Amir Amanullah Khan Award, the highest civilian honour of the country by its president, Ashraf Ghani. Prime Minister was on 3rd April 2016, conferred with Saudi Arabia's highest civilian honour 'King Abdulaziz Sash' by King Salman bin Abdulaziz at the Royal Court of Saudi Arabia. Among other notable recipients of this honour are former US President Barack Obama and British ex-PM David Cameron.